It’s been a while since I posted one of the videos with Guruka Singh so I thought it might be a good time to share another one. I didn’t want to post too many of the meditations at once and allow some of you to try them out. I am curious to know if you have tried any of the meditations that I posted earlier and what your experiences were. Obviously you have to do them in order to experience them. The Kirtan Kriya meditation is one of the first meditations that I ever learnt and is great for breaking habit patterns, emotional balance and just overall calmness and clarity. Yogi Bhajan used to say that if you had to chose just one meditation, to do this one. Watch the video below to see Guruka Singh explain the meditation and how to do it. You practice this meditation with this audio (listening online) or you can purchase a CD/MP3 download to practice this meditation with: Audio CD of Sa-Ta-Na-Ma. The 31 minute recording has the out loud, whisper, silent parts in it so that you don’t have to think about keeping time. Those who do it will understand it. Opinions and judgements are irrelevant. Just try it yourself and have the experience of it. There are those who preach and those who teach. Do not confuse the two. If you do it, stick with it, be regular in your practice and have the experience of it. It is yours, not mine. No one can take it away from you. Sa-Ta-Na-Ma is the bikri of Saat Naam. It is a bij mantra. Plant the seed of Naam within yourself with the panch shabd and let it grow. It is not a matter for discussion. It is a matter of DOING IT. This meditation releases subconscious blocks… fears, insecurities, and guilts. It balances the hemispheres and cleans the subconscious mind. It is priceless. When blocks are released the heart opens. When the heart opens tears may flow. Just keep up and let it flow. Your thoughts do not matter. Just stay in the naad of the bij mantra and let it filter everything. It is an automatic process. You don't need to do anything but keep up, be regular and experience it. A sound man feels the heartbeat of others within his own heart. I just want to add my voice for those skeptical or who debate the origins of this practice. It works! I had been a yoga practitioner for over 15 years, then discovered kundalini yoga, I practice 6 days week for 1 year now, plus I had a regular meditation practice. I had a major issue of several years standing, it was blocking my progress but I felt unable to get a handle on it. I DID THIS PRACTICE 1X, for 11 min, not expecting much but feeling that i might see some small result. After the practice–That DAY. I was able to take a huge step that I had been stuck on and it felt easy, natural, all the discomfort and emotional pain around the issue had diminished to a huge degree. I WAS STUNNED. Really. I think my previous practice made it that effective and I continue to do it regularly. I saw ? of where does this come from? so much was previously hidden from general public for good reason-so many yogic practices, and even in Buddhism there are esotheric (hidden) practices because they require preparation. So I trust as the senior teachers say Yogi Bhajan brought out these practices, so maybe there were not part of commonly known religious tradition. All religions have this orthodox vs. the non-orthodox controversies-they often cloud the mind and lead to fighting and negativity. Why can't we accept that even within one religion there are varieties of practices or sects. How do? just wanted to let you know that the vid was a useful idea and that the meditation works, as scpetic as I am….I can safely say that it does work and that other people should try it too..
P.S…. its well cold in London today with grey skies…. How long did you start the meditation with? 11 or 31 minutes? and how long did you take to see the effect you mentioned since you say it works. Thanks Guruka Ji! I want to do this every day. I just did it quietly with the office doors closed (my family consider me a religious nutcase more or less). But please can you explain me why it makes me cry. I do not feel unhappy, on the contrary, but tears are running down my cheeks. Why? This happened before (sometimes in gurdwara) and i can not figure it out. To be clear, I don’t know where these “meditations” come from. Saataanaamaa is not a Sikh mantar. I have heard of Satnam, but not saataanaamaa. Satnam itself is a description of naam but naam is something else. Naam is Gurmantar which is obtained from the Punj Pyaare at an amrit sinchaar. That is the greatest of all mantars and is the only one that an amritdhari needs to meditate on. If you want to do these meditations, it’s fine of course, but please don’t think they are part of the Sikh faith. If WaheGuru is the only mantra we need, then why do we have the entire Siri Guru Granth Sahib? Why isn’t it just one word “WaheGuru”? Why do we have raag, and naad, and anahad? Why do we read Japji in the morning? Why do we honor the truth from the begining, the truth that is present, and the truth that ever shall be in the mool mantar? Why do we mention “Ad sach,” if there was no truth before Guru Nanak? If mantras that are not in the Siri Guru Granth Sahib (or Guru Gobind Singh’s Granths) are false, why then do we pray? People recite Ardas daily, which only has Bani in the begining. I will not cheapen my experience of the mantra sat naam or the mantra WaheGuru by trying to explain it to others, but Guruka Singh is right, it is about experience. Fanaticism is so limiting. I love to chant “Satinaam Siri WaheGuru” and that mantra is close to my heart no matter what other people claim to know. If it is so desired I can compile a list of the very common shabads, sayings, and mantras amongst all Sikhs that are not in any of the Granths, but that would be a waste of time. These words have meaning to millions and don’t need to be degraded. “Waheguru” is the core and the all the “Banis” guide us along the path on which one has to travel to get to “Waheguru”. It is like we have several layers of coconut. The outer most is fiber shell, then the hard shell, then soft fruit and inside is the sweet water… Like wise, one has to travel hard path to get to the sweet tasting Naam… but only by the blessings of Satguru “Shri Guru Granth Sahib jee”. If one says one has achivevd that stage… they might be just talking… For something that is self evident, one has no need to advertise…. I would also like to add that I think that “Waheguru” doesnot need any adjectives when you recite simran. Different people have started different practices and they had been and are being propogated to the next generation…. I see the posting for a CD of the Sa Ta Na Ma chant, but does anybody know if there is a CD with the Kirtan Kriya with the chant, whisper, silent, whisper, chant? Thanks for any information. Im a sceptic when it comes to things untill I try it.. and I did try and I love it. In the begining it was hard monitors how much time has gone by. however I did download a flash program that you can set timer with.I have done the 11min version which anyone can do, even with the busiest of the schedules. Try it and you will love it then share it. Sotis Ji – If you dig many small holes, you cannot go very deep, but if you keep digging in the same spot, and are steady in your work, you will go very deep. Find a meditation that works for you and stick with it. Some days it will be harder and some days it will be easier. Some days you may be in the bliss and other days you may be angry and depressed. Good! That means it’s working. Meditation is not done to get inner peace, nor with any expectation. It is like the oil filter in a car. It cleans the negative patterns from the mind. But you have to keep up. Inner peace comes spontaneously when the mind is cleared of negativity, insecurity, worry and schemes. Do the same meditation for at least 40 days and try to do it at approximately the same time every day. May Maharaj Ji grant you his infinite kirpaa in your work on yourself. Thank you for your kind comment. Very useful indeed. I will stick on this..i am so exited experiencing all these and the wanting to learn and create is growing every moment that passes.The inner voice that started speak to me since i was 14 is now a bliss when it is here and i am so happy that i am a seeker and be able to meet great people like you. Guruka Singh Ji, whenever I complete this meditation (I have only done it for 11 minutes) it seems as though I have difficulty breathing properly…not drastically but it just feels like I cannot catch a full breath. I think it has something to do with my brain…as this mantra does. Do you have any suggestions? In Response to prabhu singh- If waheguru is everything then why we need GuruGranth” be very clear that Guru Granth Is our GURU and WAHEGURU Is GOD Itself.Now By practical application of GuruGranth’s teachings in life one can reach WAHEGURU- in real Prakash Roop. Bani Guru ,Guru Hai Bani which Bani amrit sarey, Gurbani Kahey sewak Jan Maney Prathak Guru Nistarey”. Reciting, reading daily banis guide us to only one thing Remembering God everybreath-Which is Simran-Nam Jap. Regarding Satnam or Waheguru. Now There is lot of confusion created by different people. All the names are revered ones, which are adjective of Lord. In Gurbani Ram, Beethal, Govind, Allah, sai ,Satnam Waheguru, EkONKar Waheguru different adjectives have been used. They all are respectable words/adjectives. But this does not mean we should start chanting all of them for meditation. For meditation (Nam Japana) only GURMANTAR is allowed and acceptable. GURMANTAR Means one which is administered by Guru Himself. When we get baptized we are given â€œWAHEGURUâ€ by Panj pyaras. â€œWAHEGURU GURMANTAR HAI PRIM PYALA CHUP CHABOLAâ€ Gurmantar waheguru is not an ordinary word and adjective but it has power of Ten Gurus behind it also. Any other word can be a mantar but not Gurmantar, because it has no power backing it. So it cannot be fruitful. Other Mantar(Satnam or EkONkar waheguru) can lead to concentration of mind but not Naam. Infact any mechanical method can lead to concentration of mind but not NAAM and Sehaj, which is ultimate goal of life according to Gurmat.one must understand the difference between Naam(divine love in continuity) and Sunn-concentration of mind only which is temporary peace,dreary and leads to nowhere like a sattelite in empty space. Now regarding method of meditation. â€MIL SADH SANGAT BHAJ KEWAL NAAMâ€ Utter waheguru with your Tongue , listen to waheguru uttered by yourself. This will concentrate your mind automatically. 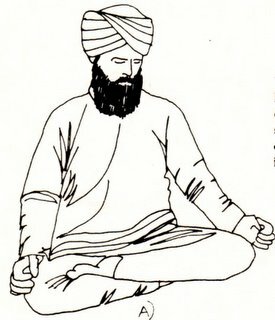 There is greater effort to project differently and make things complicated (which are made so simple by guru ji)Yogic techniques has no place in gurmat as suggested by some one earlier- while inhaling say WAH and Guru while exhaling-Sa Ta Na Ma. This is Manmat.Now people have freedom to choose whatever method they like. – A Baby does not know all this. JIN PREM KIYO TIN HEE PRABH PAYOâ€. You have to become a baby who has full faith in her mother only but mother. Our mother is â€œWaheguruâ€ and calling HIM like a baby, seperated from mother ,with love, passion and faith , is Simran or Naam Japana. This will lead to Gurmantar percolating to your unconscious mind. By constant repetition waheguru recitation turns sweet and leads to Vairag. Then it goes to your throat automatically after abhyas and then to your Heart. Here it manifests, dissolves, in its parkash roop and vibrations. As said by kabeerji-â€œEY AKHAR KHIR JAYENGEY O AKHAR UN MEIN NAHEâ€ Beyond this is Chautha pad. Remember Word â€œWAHEGURUâ€ is GOD. With word on your tongue GOD is on your tongue with Word in your Heart God is in your heart, word in your mind God is in your mind, with Word in your soul God is in your soul. i suggest Follow this link to writings on simran to clear all doubts. I appreciate your response, but with all due respect none of what you wrote is based in reality. Everything you wrote is a personal opinion held by you and a certain group of Sikhs. There is no historical proof that anybody inhaled Wah and exhaled Guru, before recent times. This pranayam (breath control), which is not based in yogic technology is not even close to the experience of real pranayam. If you want to talk about manmat, why should I trust this recent form of breath control over thousands of years of yogic technique? I’ll leave it at that. Furthermore simran is not something you do, it is something you achieve. Simran is constant rememberence of the beloved. As a Sikh I obviously chant WaheGuru very often, but it is not the only mantra given to us. As you are aware Gurbani states: “Jap Man Sat Naam, Sada Sat Naam.” No where in the Siri Guru Granth Sahib does it state “Japo WaheGuru,” however it clearly states the above which means that one should repeat SAT NAAM in the mind, ALWAYS SAT NAAM! So please don’t refute Gurbani. What you have written I’ve read a thousand times before, what I have experienced cannot be explained in words. Your narrow view of yoga and breath control will lead your mind and life experience to something very different than my experience. Prabhu, you are right that Guru Granth sabhib says jap sat nam, but what is ” sat Nam” Sat Nam means true name, then what is the True name “its WAHEGuru”. However, it should not matter how and what people use for meditation. IT could be any word from Guru Granth Sabib it is equivalent to every thing. What i write is not my personal opinion only or of certain group of people. This is what i learnt, experienced and am living in the company of sadh sangat and in light of gurbani. I do not dare to refute Guru Granth or instruct others as you have claimed. I say what i practice and as told to me by Panj pyaras and according to Gurmat Rehat which is followed all over the world. Sikhi is not about trying and picking whatever you like and then experiencing on your own. Its about following Guru’s rehat/order/command as It is. Then and Then only we are sikhs of guru. Your experience and my experience should not be different as we are Sikhs of same Guru and worship One lord-as long we are following the same path-thatâ€™s why it is a Panth- Khalsa Brotherhood.But it can be if our approach is different. Now In response to what you said â€“â€œ As you are aware Gurbani states: â€œJap Man Sat Naam, Sada Sat Naam.â€ No where in the Siri Guru Granth Sahib does it state â€œJapo WaheGuru,â€ however it clearly states the above which means that one should repeat SAT NAAM in the mind, ALWAYS SAT NAAM! So please donâ€™t refute Gurbaniâ€. I bow before the Guru (Guru Nanak Dev) who recited the True Name. vaahiguroo guroo manthr hai jap houmain khoee|| “Vahiguru is the gurmantra; by repeating it thou hast thy ego erased,” (Varan X111.2). In Satyug, Visnu in the form of Vasudev is said to have incarnated and â€˜Vâ€™ Of Vahiguru reminds of Visnu. The true Guru of dvapar is said to be Harikrsna and â€˜Hâ€™ of Vahiguru reminds of Hari. In the the treta was Ram and â€˜Râ€™ of Vahiguru tells that rembering Ram will produce joy and happiness. In kalijug, Gobind is in the form of Nanak and â€˜Gâ€™ of Vahiguru gets Govind recited. The recitations o f all the four ages subsume in Panchayan i.e. in the soul of the common man. I don’t agree with your comment that “Your experience and my experience should not be different as we are Sikhs of same Guru and worship One lord..” because every human being is at different levels of spirutality and therefore they may have different experiences of meditation then their peers. However, if the entire sikh brothers were at the same level of botherhood, spirtuality then we might consider that we may have similar experiences. However, what is the probability that every human being as sikhs or khalsa belongs at the same level, which is very unlikely. For instance, if 10 sikhs begin to mediatate on waheguru for 3 months and the end of three months these 68% of them may end up having some what similar experences but the rest of percentage may have different experiences. The reason is that the experiences felt during meditation reflects our attention span ( mind is not wondering), our daily ethics, and diet. If these do not match up then we will not excel in our meditation. So, its impossible that two human beings will exactly have same kind of karma’s and enlightment. Now the discussion about SatNam and waheguru. I don’t think that it will make any difference on what shabad we meditate on unless it is not present in Guru Granth sabhib. These words come again and again in SGGS. We could refute each other on these kinds of issues and waste our time because we could have done meditation on it , seva or have joined sangat. But humans do have tendency to keep on finding what is the best way to do this and that , and all their life they just keep on gathering knowledge but Never practice it. However, if practice of meditation (kirtan, satnam, waheguru etc) at end will give the same result. Just like Guru Gobind singh ji wrote many names of God yet God does not have any name, God exists in every being yet is separate too and so on….. This is simply impossible. We have the same Guru, but no two people are the same. I understand that for you and a certain jetha of Sikhs things are done an exact way and nothing deviates from that. However, that doesn’t reflect the whole panth or even the majority of the panth. You can think that no panj pyaray tell people to meditate on Sat Naam, but I’ve heard the Panj Pyaray tell this to those receiving Amrit. The truth is ‘WaheGuru’ is the Gurmantra and ‘Sat Naam’ is the beej mantra. This is what the Panj Pyaray instructed. Believing that your way is the only way of Gurmat and the rest of the ways are manmat is extremely narrow and limited to your ‘man’ (mind). Seeing God in everything and seeing the hand of the Guru manifested in the practice of all Sikhs is universal (EkOngKar). To me that is Gurmat, seeing God and Guru in everything. I see the hand of the Guru in what you practice, but my different pracitces also come from the Guru’s rehit and Gurmat. I don’t believe Gurmat allows narrow thinking, and limitations on personal practices of meditation. Guru Nanak instructed his Hindu followers to be good Hindus and his Muslim followers to be good Muslims, because he knew that any honest worship/rememberence/simran of God is worthy in the court of the Lord. Prabhu Singh Ji I don’t belong to any jatha or group. I said again whatever you practice and choose is everyone’s personal choice, No problem with that- hindus, moslems or sikhs for that matter. whatever i said is according to Gurbani, Rehat, becos you asked where it is written in Gurbani -Japo Waheguru. You may be different and trying diffrent things thats your personal choice, no problem with that-At least you are trying something you believe can lead you to Truth – which you are mistaken to consider as Gurmat. But i have not heard which Rehat, and where in gurbani says about kriyas you do. Never in history any Sikh Guru preached these kind of yogic Kriyas to achieve Akal Purakh. If they have please enlighten us through gurbani. Same time I have no narrow vision for Moslem doing namaz or hindus Arti. Thatâ€™s their method, rituals and practice. I respect them if they remember God in whatever form they believe and method they use. Rehat and Gurmat is one, not different for different Sikhs. Any deviation from that is Kurehat and Manmat. BHAGAT BINA BHUAH DUBEY SAYANEY. Sir, on this debate of yours that waheguru mantra is better for meditation or satnam mantra is better ,i’ll just like to say that you can’t win god or even yourself with any mantra .Meditation is just for making your mind clear of negative thoughts and filling it with bliss&love .Love for god ,humanity.It’s that love which can make us acceptable in the eyes of god. So u can recite anything whether it is ram or allah.BUT if you follow sikhism than gurumantra is ‘prefferable’. I think there is misunderstanding about kirya’s.. Kirya’s are excercises that may increase our muscle strength to sit right, control of breathing and it will try to calm the mind. These Kiryas are just excercises to raise the awareness that shakti does exist in our bodies. Kirya’s are NOT there to replace Gurbani at all. Just like, if I go to the gym and lift weights for 30min and then come home and meditate on Shabad I have found that I have a better focus during the meditation and able to really feel shabad elevating spiritual energy. So, the misunderstanding is that we think that these kiryas are subsitute for Gurbani or we don’t need Gurbani. Gurbani is a channel that will link us directly with God’s channel and will provide us strength to face five theives and to over come maya. Gurbani is the only way for sikhs to connect with God. Finally, I think all of us have tendency to really find out the rules for everything. Humans spend to much time and energy to find out rules and discuss about rules. Rules what to do or what not to do. But we fail to practice meditation, seva etc. If a person keeps on learning or pondering on traffic rules all their lives but never drove a car then those individuals will never learn to drive a car. So, lets not get more tangled in the web of rules. We all know simply that be true, do seva, work hard, meditate, share and thats it. Knowledge is like a light source for us to walk on the path that would lead us to God. But if we keep on dancing around the light (like insects fly around the light and die) all our life assuming that we will find God within this light then we are simply wasting our time. Again, the light of knowledge is to use this light to walk on the path. And this path is not easy. I’m not saying Sat Naam or WaheGuru is better, they’re both GREAT! I’m just saying that it is so narrow and totally ego-centric to say that your way is Gurmat and everybody else’s way is manmat! That’s ridiculous. There are many practices the Gurus taught (like gatka/shaster vidiya) that people don’t do. Everybody sits in the yogic “bir asan” to recieve amrit and then like to argue that yoga has no place. People are just being narrow and sticking to their limited definition of Gurmat. Who should I believe somebody telling me my practice is manmat or the Guru who has given me Gurbani to answer all my questions? Dear G’ I agree with you that Yogic kriyas have a role to play to balance physical body and improve neurological awareness by balancing sympathetic and parasympathetic sytems and increasing oxygen concentration in blood. All our spiritual experiences are through nervous system which improves through yogic pranayams. So yogic kriyas can be a tool only to prepare physical body and improve awareness and ready our nerves for meditation on Gurmantar/ or whatever other Mantra and Gurbani. Now feeling light, joyous, state of thoughtlessness, spinning in head on breath holding or hyperventilation( which happens on exhaling and inhaling continuously) has nothing to do with Naam and experience of Tat Shabad Guru. These experiences can happen in medical setting also where people are put on 100% oxygen, hysterical , delusional and hallucinating people who hear different sounds, see lights or people talking to them. Tat Shabad is beyond these mental illusions of Gods talking to people. “PÄá¹¯áº– paá¹›io ar bÄ—á¸ bÄ«cáº–Ärio nival báº–uangam sÄá¸áº–Ä—. PiÄrÄ— in biá¸áº– milaá¹‡ na jÄÄ« mai kÄ«Ä— karam anÄ—kÄ. HÄr pario suÄmÄ« kai á¸uÄrai á¸Ä«jai buá¸áº– bibÄ—kÄ. RahÄo. Mon báº–aio karpÄá¹¯Ä« rahio nagan firio ban mÄhÄ«. Man kÄmnÄ á¹¯irath jÄÄ— basio sir karvaá¹¯ á¸áº–arÄÄ—. Jog siá¸áº– Äsaá¹‡ cáº–aorÄsÄ«h Ä— báº–Ä« kar kar rahiÄ. Har kÄ«raá¹¯ sÄá¸áº–sangaá¹¯ hai sir karman kai karmÄ. Singing the Kirtan of the Lord’s Praises in the Saadh Sangat, the Company of the Holy, is the highest of all actions. Å¦Ä—ro sÄ—vak ih rang mÄá¹¯Ä. REHAT BINA DAR CHOTA KHAVEY. Prabhu singh jee what did guru Ji Tell you directly? after reading it what i get is that we are not capable of doing anything,we r just like puppets in the hands of god,more we use our mind that this mantra is good this is not good ,more we’ll create problems for ourself.So it is 100 times better to surrender in front of guru to get the blessings of the guru.After all it’s our feelings for the god which counts for ,meditation is just for arousing that feelings.So ,use any mantra which helps u in arousing that feelings ,all is acceptable in gurmat. The shabad that you have given for discussion clearly does not state that do not do yoga, but it says that if you only do excercises (yogic form) and think that you will obtain God through it, which will just leave us astray. Because we do not have love for God in our hearts and we do not meditate upon God. They refers to anyone who reads scriptures ( could be vedas. Bible, SGGS) and Some people practice yoga and breath for cleasning. Even Granthi sahib who does akand path for their entire life have seen stealing money or taking alcohol. these are facts out there etc. You might have seen discovering channel where they show Buddhsit monks meditate to control their mind and they acquire some sort of powers. Therefore the above people never had love for God and his creation, and are unable to control five passions and they cannot was their ego away buy just performing rituals of any sort. Guru ji is saying, O dear ones you will not meet the lord by just performing these rituals. So, People will get tired of performing these kind of rituals but only by surrendering to God will save us. It is clearly states that rituals of any kind ( daily going to temple, meditation, yoga , scarificing one’s head) will do nothing. These attempts are made either to gain popularity among comunnity members or family members. Every thing is Futile if we do not have Love for God and Do not follow ethics. Yogis have done meditation to obtain powers but these powers will not lead them to God because these powers are another level of Maya where the yogis get lost just like ordinary people get lost by just performing daily rituals of every kind and sort. Therefore, Singing Kirtan with love in the heart will take us to our destiny. But if we do not have love for God and we do not try to live righteously (ethically) even doing kirtan becomes a ritual. Just like some of Kirtan jatha’s have been known to drink alcohol, eat meat, and have other desires, yet they do kirtan everyday in front of sadh sangat and in the presence of Guruji. Their performance of kirtan also becomes a ritual , just like any rituals mentioned above. Therefore, anything done ( sikh temple, church, mosque) becomes a ritual if there is no love for God in the heart and we do not try to follow ethics. Guruji is giving this universal messange to everyone who ever reads vedas, SGGS, Bible and yogis who do yoga to obtain powers will become fruitless at the end because they will die and birth -death cycle will repeat. Only those are saved who surrender their MIND, Body, and Soul to God and have love for God. Only those can fight against five theives if they try hard to follow God’s instructions and only when they are Blessed. So, Sabhad pertains to every individual who might have different practices. It does not mention that Yoga is probhited. Finally, People have different ways to stay in good health and it could be any kind of excercise. I have mentioned before that nothing compares with Gurban and Gurbani is the only channel to connect with God. if you want refute any practice then you have to provide research evidence whatever you are mentioning. Have you read reasearch done on monks? With 100% oxygen I think there might be some other deleterious affects on health than just hallucinating. People who only have unshakable theory or thoughts are said to be delusional, because these kind of people fail to recongize point of view from other peoples perspective. I think probably you are a book reader and form theories out of the context. How can you be sure that people who do yogic practices for sure get hallicuinations etc. However, the sabhad posted by you, states that people to get yogic powers through their practice but at the end its all futile because it was done to obtain powers ( secondary maya). However, the experiences felt by yogis is stated as powers not hallucinations. Therefore, If these yogic excercises can tune my mind into one frequency when I recite the gur mantar or banis then don’t you think that will have a better effect of connecting with God. Finally, If you don’t like to excercise, to eat healthy, or don’t like to take medications when you are sick, even though meds have lot of side effects as well, then that is YOUR CHOICE NOT MINE. How can you make YOUR choices as Gurmant and other people choices MANmant. Again, if you dislike to stretch your body before reciting the prayers thats YOUR Choice, but I would like to stretch my body and prepare my mind for a deeper meditation and that’s MINE CHOICE. The conflict is about Choices………. Everybody has the ability to speak to the Guru and get an answer. That’s the purpose of receiving a hukmnama, direction from the Guru. People try to tell me that what I do is wrong, yet every time I ask the Guru, Guru Ji replies that my destiny has been perfectly aligned. So why would I believe the average joe, when the Guru has repeatedly told me that I am on the right path? The average joe might get tired of answering the same question over and over again, but Guru Ji has infinite wisdom, compassion and patience and always answers questions for me. If you’re worried about hyperventilation when doing yoga, first you’re not doing it right. Secondly there’s a much better possibility of hyperventalating using the breathing technique you yourself prescribe, when chanting WaheGuru. I’m not telling anybody what to do or saying that my way is right for others. I’m not even saying what my way is. I’m only saying that there’s not just the way of Dr. Sandeep Singh and the rest is manmat. There’s nothing separate from God, that is Ek Ong Kar, our first instruction. Whatever I write you are misunderstanding my point of view . First I never wrote about hyperventilating while doing Waheguru simran. I wrote â€œrepetetion of Gurmantar â€œWaheguruâ€ incessantly with love and devotion like a baby crying for mother, is the way To meet Akal Purakh. Second the Gurmantar- Waheguru- is definitely more fruitful than any other Mantra becos it has power of Ten Gurus behind this and personally given by Panj Pyaras. Otherwise what was the need of Gurmantar when all other Mantras and words are equal to it. Other mantras can lead you to higher stage of mental concentration which is still in control of Maya and all experiences which are considered hence spiritual are all actually illusions as Maya Itself is illusion. Pls let me know where It happens? As Akal Takhat should have strict guide lines about Amrit Sanchaar in Sikhi. Third -All Meditationl experiences which are considered spiritual- seeing lights, hovering around the room, feeling of lightness, tingling in skin, vibrations, talking to unseen souls and Gods CAN be Illusions, as they are over when you leave your Yogic posture or open your eyes. Any experience devoid of Divine love which is lasting only till you are putting your efforts is- still in Maya. Its like a short ostrich flight. Actual stage is Naam- 24 hours effortless divine love from which you can not escape- as your will merges with divine will- then what you experience spiritually is everlasting actual spiritual experience. If I utter your name I live, if forget I will die. In the end I would say if you guys spent more time reading Gurbani and understanding you will benefit better than spending time in these Kriyas as none you practice and written till now has been supported by Gurbani, which is very evident from above discussion. I agree with above line. I am off to Samagam for 2 days and shall try this way, i think it can be amazing. Please read- “None you practice” i mean – Yogic Kriyas only. The Panj Pyaray represent Guru Gobind Singh and you want the Akal Takht to straighten them out? That’s ridiculous. How can personal efforts be maya? The Guru says: “Jap Man Sat Naam, Sadaa Sat Naam.” Jap means meditate and repeat. Simran is the stage of constant rememberence, it’s not something done, but acheived. That’s why Guru Ji says “Sadaa” always repeat in your mind “Sat Naam.” You want me to read more Gurbani, but you haven’t even understood this one line that I have quoted over and over again. Furthermore, I already mentioned that I read Gurbani whenever I need direction. Guru Ji gives me hukamnamas and clearly answers all my questions. This is an endless debate. My request to the sangat is don’t accept anybody’s method as the ONLY way. Guru Ji gave us a lot more than most Sikhs practice and understand. There is at least one kriya described within the Siri Guru Granth Sahib and there are several more described in the writings of Guru Gobind Singh. Just chanting ‘WaheGuru’ over and over again isn’t the only method. As some people can attest, that can be turned into a ritual as well. Go with your inspiration which is the only thing that will work. By God’s grace you may find chanting “WaheGuru” is what inspires you the most. Disobeying other people’s rehits, or strict practices is only an insult to their ego. Doing something without inspiration and out of ritual because “you’re supposed to” is the biggest insult to the legacy of Guru Nanak. Its Guru’s job to decide if someone is capable of fruit, not us. Our job is follow what Guruji ( Gobind singh ji) ” his purest command and Authoritive Command for sikhs is Guru man-yo Granth. Thats All I need in my life. A connection between Guruji and me is my personal matter. If Guruji is out there to Guide us, but our job is to strive for perfection by meditation, seva, sandh sangat, and by sharing. NOT only with our own community but also among other communities. I do not like to make things complex and loose the basic essence of sikhism. What is fruitful or not lets leave it to Guruji. If we practice what we preach then Guruji will bless us and thats all I need. Finally, All sikhs have their personal relationship with Guru Granth sabhib because that is our living Guru. The question is do we really consider SGGS as our living guru from our heart, soul and mind. If yes, then we don’t not need any instructions from the Human flesh. Yes, we can have constructive discussions as we have been having and keep our emotions to the side. Sat Shri Akal. Gurumustuk Singh I hope you don’t mind that I ask this on the website so I can get a faster response. My question is how would I know that 2 minutes, 3 minutes, etc have passed by while doing this exercise? http://www.spiritvoyage.com/shopping/detail_clips.cfm?sku=CDS-001156 (Second Audio Track). This goes through the loud…whisper….quiet….whisper…loud cycles of chanting it. You could of course record yourself or some other sound that plays for the number of minutes….which will give you a queue when to change…. I been doing meditation since 2004 after one saint in malaysia awaken my kundalini shakti. since then I have become very spiritual. The Gurbani become very sweet to my ear and heart. The name of God was also implanted in my heart because meditation have make my doubts about religion,caste,material,where is god was cleared. I asked from Guru Nanak I want His Name…..and in one occasion this saint blessed me His name and I chant His name whole hearthedly. I seeing changes already and during last vasaikhi, once the akhand path finished just before the gianiji do the ardas, i saw Guru Nanak vision appear at the place where GuruGranth was placed. I forever sacrifice to this saint who have enlighten me for last 4 years and I will continue do this meditation until see the Lord. Along the way I together with thousands got initiated many times and all my 5 chakras was activated by Guruji. Every month in Kuala Lumpur, Guruji awaken people’s kundalini shakti. Kundalini once awaken is the begining of spirituality. By god’s grace He found me this Saint. As Gurbani said ‘always seek dust feet of the saint’….even writing this comments, my chakra between my eyebrow vibrates…….pls feel to email me [email protected] if need to know further also search in WebWorld “yoga jnana sitthat om sri raja yoga guru sarnam”. This saint is incarnation of God. During my first year I have doubts about this saint and Guru Nanak if I’m following wrong path and next day in early morning I had a dream this saint hold my hand and bring me to a place where all 10 Sikh Gurus was there and this saint pass me to them. I woke up after that. Spiritual is wide topics but until we don’t meet such great saint, we are not able to understand our self and God. I have a meditation question for you, which you may or may not be able to answer. I'm interested in this video because of its benefits but every time I try meditation, and try to concentrate on the forehead/third eye area, I experience severe headaches. I feel intense pressure and have to stop. Do you know why this occurs? Thanks….. Some people may experience headaches from practicing Kirtan Kriya. The most common reason for this is improper circulation of prana in the solar centers. To avoid or correct this problem, meditate on the primal sounds in the “L” form. This means feel there is a constant inflow of cosmic energy into the solar center, or Tenth Gate. Imagine the energy of each sound moving through the Crown Chakra, and out through the Third Eye Point as it is projected to Infinity. This energy flow follows the energy pathway called the Golden Cord—the connection between the pineal and pituitary glands. You may also want to try covering the head with a natural fiber cloth. I am at day 20 of the SaTaNaMa meditation… I usually practice for 31 minutes a day.Â I’m finding it hard to stay focused.Â My legs get numb and I get very distracted.Â Is this part of the process?Â Any suggestions on how to go deeper into this meditation? Thank you kindly!Â And this is a wonderful sight. Personally, I like the meditation. Meantime, understanding that each sound has a meaning, there is a strange connection (let’s say, a philological one) with an English word… Satan. If we look at Russian language, which is a one root with Indian languages and both of them belong to the Hindu-European group of languages, we can see such a connection in a really strong way. Russian word “SaTaNa” literally stands for ‘Satan”. Could you please comment on that? Your response will be highly appreciated been sent to my email. Nina, I don’t think the word Satan has anything to do with this. Mantras are powerful tools for clearing and restructuring the subconscious mind. SAT NAM and its derivative SA TA NA MA are the two basic mantras taught by Yogi Bhajan to reorient the mind and thus open us up to the possibility of transformational change. SAT NAM seeds the truth in our consciousness by waking us up to our divine identity. SAT NAM is the seed or bij mantra. SA TA NA MA incorporates the nuclear sounds of SAT NAM. SA TA NA MA uses the primal sounds to connect us to the evolutionary nature of existence itself. It is referred to as the panch shabd, which means a mantra with five sound currents. The fifth sound is “A.” When we chant SA TA NA MA we imprint the evolutionary code of the universe into our human psyche. Kirtin Kriya, often referred to as SA TA NA MA meditation, is the most important meditation in Kundalini Yoga. It was one of the first meditations taught by Yogi Bhajan and remains today as a foundation meditation recommended for every student of Kundalini yoga. Yogi Bhajan says that if you can do only one meditation, this is it. It does everything for you in the order that you need. It is your teacher. And as you practice it, you will come to realize that it is your best friend. Whatever you need at the moment, it will readjust and align you to bring balance into your mind and thus your life. This meditation is given for everything from breaking habits to achieving emotional balance. I knew one woman who had been very emotionally upset for over two weeks. Finally she went to a quiet spot in the woods and did 31 minutes of Kirtin Kriya and voila, she felt relaxed and whole again. It helps you focus and center yourself. It is a catalyst for change because it is a very powerful spiritual cleanser. You may go through a lot because you will be releasing a lot. Be present to what you are experiencing and be willing to let it all go. The process will allow you to give all your garbage back to God. If you want to maintain the status quo, don’t do this meditation. If you are willing to change and welcome a new dimension of being into your life, this meditation is for you. The bottom line is that this meditation works. All you have to do is do it. You can trust the process and the technology. The radiance of the psyche is dependent upon the active functioning of both the pituitary and pineal glands. The pituitary gland regulates the entire glandular system. The secretion of the pineal gland creates a pulsating radiance that activates the pituitary gland. The mind goes out of balance when the pineal gland is dormant. The imbalance makes it seem impossible to break mental and physical addictions. The mantra SA TA NA MA to a powerful tool to recreate balance in the mind.